Cut off whiskers, and remove prawn head. Gently dispose the outer shell as shown in the image above. Remove shell from body and devein. Butterfly the prawns. Rinse and pat dry using paper towels. Rinse lemon and cut into slices. Place them neatly on serving plate. Simply mix the corn flour with pepper and salt. Coat prawns and dust off excess flour. Heat oil and deep fry prawns till they turn pink. Drain and set aside. Next, deep fry the prawn heads till crispy. Drain. Toss your prawns and place them neatly onto serving plate. 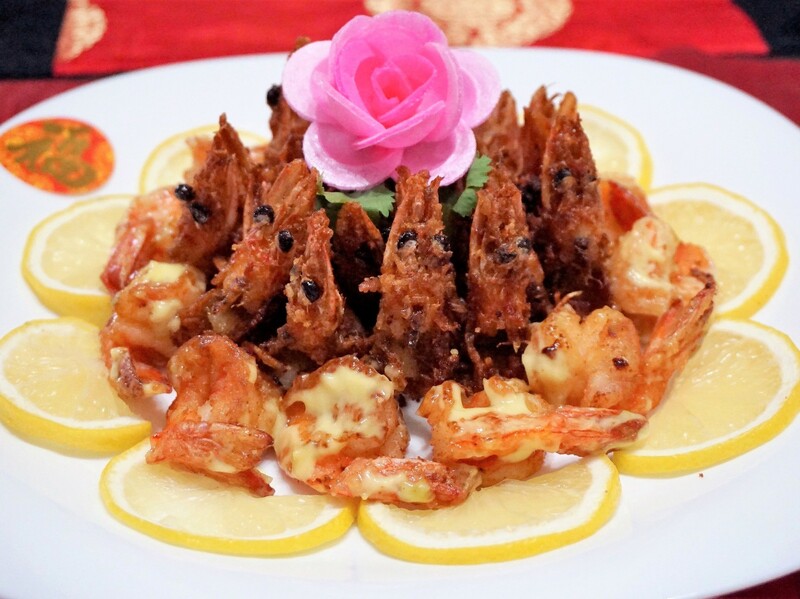 Serve your CNY Crispy Yuan Yang Wasabi Prawns ( 嘻哈鸳鸯芥末虾球 ) with lemon slices. Hello guys, fans of Deep-Fried Food or Prawns will fall in love with this CNY Crispy Yuan Yang Wasabi Prawns ( 嘻哈鸳鸯芥末虾球 )! Do you know that besides keeping your prawn heads for making soup, you can also deep-fry them, turning these crunchy heads into a delicious treat?